Every LT is engineered with absolute focus. To be faster. Lighter. Nimbler. To provide undiluted feedback and encourage you to push. To the edge and even further. 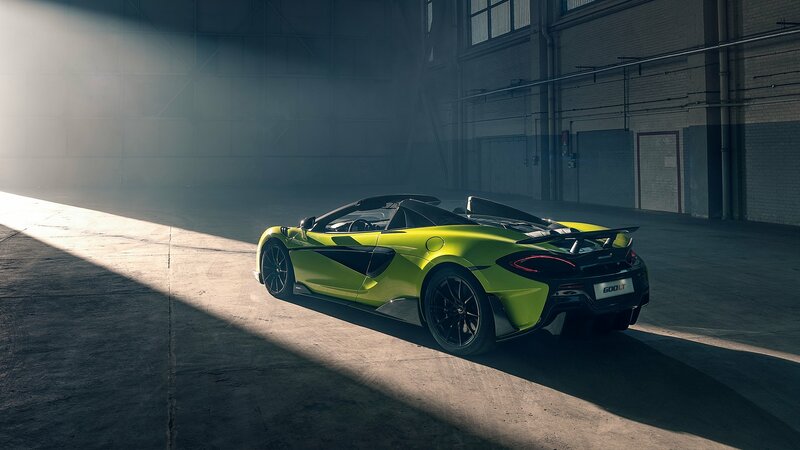 The new McLaren 600LT Spider takes this formidable mix and intensifies it – heightening every sensation. The aggressive design language is LT to the last detail. The radical fixed aerodynamic package features a unique rear wing. The car is longer at both ends. And lower. The retractable hard top and tonneau storage area flow perfectly into the whole. The 600LT Spider does nothing by halves. And it shows. Among the muscular forms and sharp lines are elements that could only ever be McLaren. The dramatic rear buttresses and dihedral doors. The signature daytime running lights in the shape of the famous speed mark – now darkened and featuring a bespoke 600LT design. Roof up or down, the 600LT Spider has a sense of perfect balance. Everything is there for a purpose. Upholding the LT name in open-air style. The retractable folding hard top operates at speeds up to 25 mph (40kph). In less than 15 seconds the roof lowers and stores – and suddenly you’re sitting in a different kind of LT. One where the sense of speed is even more intense. And the incredible exhaust sound fills the cabin. Using proven technology from the 675LT Spider, the folding hard top system puts conventional soft tops in the shade. Made from sheet molding compound (SMC) composite that’s lighter than fabric, we’ve minimized the weight gain over the 600LT Coupe and kept the center of gravity low. This unique design is also much more refined when closed – filtering out unwanted noise so you can fully enjoy the soundtrack of your drive. It’s far better at shrugging off bad weather too. A McLaren only wears the ‘LT’ badge when it’s undergone a radical and uncompromising programme of change. It’s got a lot to live up to. Nothing escapes attention. That’s why the 600LT Spider is by far the lightest car in its class. And why it engages you so completely when you drive it. The target when creating the car was to save 90kg. The final result? 94.1kg. A figure that rises to 102.2kg with the optional Clubsport pack. Built around the immensely strong and light MonoCell II carbon fiber chassis and lightweight aluminum bodywork, the silhouette is 47mm longer. With good reason. This elongated tail generates an extra 100kg of down force at 155mph (250kph). 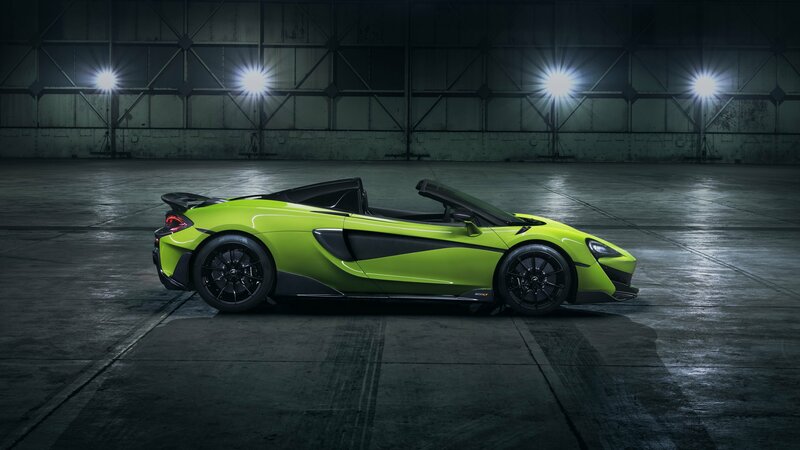 The 600LT Spider demands no compromises when it comes to primal performance. It takes 2.9 seconds to reach 62mph. Matching the 600LT Coupe exactly. It will sprint from 0-124mph (200kph). Before powering on to an incredible 201mph (324kph) top speed. At its heart lies enormous power. Propelled by a McLaren 3.8 litre twin-turbocharged V8, but with an extra 30PS and 20Nm of torque. The superfast Inertia Push gearshifts, developed on the 675LT, offer instant changes and an intoxicating sense of engagement. The only difference is just how close you can get to the sound and sensation of unbridled speed, the moment you lower the roof.